One of the things that surprises me every fall is how maple trees don’t turn color all at once. Instead, one day while walking Jack, I’ll notice a splotch of brilliant orange. And a day or two later, maybe that whole side of the tree is orange. And so on. It’s amazing. Although I filtered the above image because I like filters, this IS really what the color distribution is. And here’s my first draft. This one fell out on my screen and felt right. Good Thursday Morning Laura & Poets. I spent yesterday morning thinking it was Thursday and thought the photo prompt (poem sketch, actually) was extra challenging. Oh, my. My brain is carrying too many marbles this week. Like so many writers, I’m fascinated with the personification of trees. Trees hold so many lessons for us, I think. I miss summer so much! I knew the details of the school year would just crash in as they have. But, the only way to another summer is three more seasons….so, I will sweep up the ashes and stay strong through the winter with an image of your firework, Laura! There’s no rhyme for orange. Unique – just like orange! I love this, Linda. Comparing wordplay with season Play Feels just right somehow. And how you describe getting through the seasons to get to summer is pretty much just how I feel about fall. Always good to hear from someone with a different point of view. Happy Thursday! Linda I love summer too, but fall has a special place in my heart, perhaps it’s because I was born in the fall. Excellent poem. Good morning! I love coming here to start my day with poetry. The orange flash and flare is a beautiful gift of fall. We have little color change here in the south south. There will come a day when I won’t be teaching and I can travel to see some colors. Of course you’ve got us dancing into fall! Almost makes me forget what’s coming! I love all your w sounds, Margaret. They make the poem itself feel like it’s dancing! Colorful leaves, and wispy winds, what a wonderful fall dance…so beautiful. That sun needs to be more careful! This gives a nice visual! Oh, Amelia. This poem feels suspended in time. It also reminds me of one of my favorite poems by Lilian Moore. At least, I think it’s by her. I’m out walking right now, but when I get home later today I’m going to look for it and share it here. Thanks for this moment of beauty. That title is spectacular….ties all the lines together perfectly. That’s beautiful! Thank you for finding and sharing it! Oh, those firestarters…..ignite, light, ablaze…..great words in this short poem. 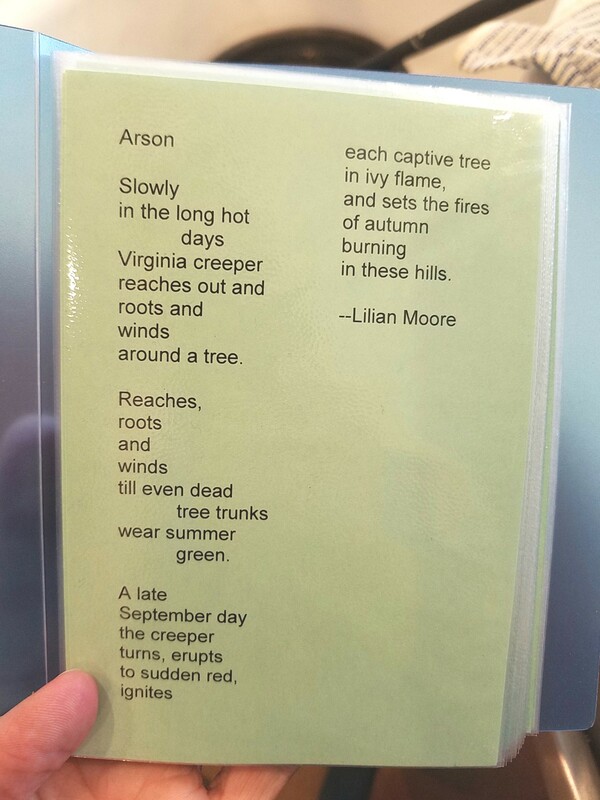 I had started some poems on just this topic, and snapped a few pictures of trees just starting to burst into flame. It’s a perfect prompt for this week, as the edges and centers of trees are just catching on now… Your poem captures it perfectly! Love those ashes – well, not in real life. Donna, this made me laugh, because I’ve often thought of trees and how they compare to kids. And the maple, my absolute favorite in Fall, would probably be the popular girl, with all the other girls feeling like they are being outshined. Which they are. In general, I’m not a fan of the popular girl, but I will take every single glorious Maple that I can and admire it! PS I don’t know why my voice to text capitalizes certain words. In the picture that spruce just seems to be looking in awe at the maple – so like humans! How we love to admire beauty! You really captured the feeling. Oh, I really like this…..it’s a perfect story: beginning, middle and end. Very well done with that twist at the end. Good morning. Our leaves are beginning to show off their colors here in western NC. I have a black gum tree that allows one branch of leaves to turn fiery red, beginning in late August, and only when those leaves are completely yellow and ready to fall will we begin to notice a change in the other leaves on that tree. And, it’s the exact same place on the tree year after year. Makes me think of the pace car in racing. Martha, I love that metaphor of that first Branch as the pace car in a race. And it fits so perfectly because Autumn seems to rush by so quickly every year. Probably just because it’s my favorite. This reminds me of the race “light tree” when race cars take off….they see the red, red, red, green! Great image. Thanks Linda. Fall is my favorite season. Laura I absolutely love the fall season, the changing leaves, the smells in the air. You’re picture is so beautiful, and your poem captures the sense of how fall alights so quickly, leaving summer in its dust. Fall colors are so passionate and were the inspiration for my poem. spreading from limb to limb. Passions explode in fiery, crimson hues. I can feel the emotion! I love this, Jean. It feels like the manifesto for a civil rights movement or something. I especially love that middle line! Loved your poem, Laura. This one came quickly for me, too. Flash fire of poetry! Oops I hit send too soon. I really love that you used bloom in a poem about fall, which is so unexpected! Your camera filter turns that maple into a dancing flame–making this tree even more magical! Haha! It’s the entire transition from Summer to Winter in four short lines. Nicely done! This brings back such lovely memories of tissue paper art and of fingers dyed all the different colors from when the glue got on the tissue paper! I love these, Matt. It does look like soft serve in the image! But then in that second one I love all those un and en and on and om sounds. They seem to echo and build, just like a fire. And, sure, please feel free to share photo and link! Thanks, Laura! I love alliteration and internal rhyme, so I’m glad you noticed those sounds…I wanted to create a sort of meditative quality to the words. I’ve been so caught up with ‘Flashlight Night,’ I had no idea what I was going to post for Poetry Friday tomorrow – and then I came across your photo! Oh, I love the turn this takes. The first line is a bit ominous, but you relieve the tension right away with “sheltered…” And then those delicious descriptions. Swoon. What a great picture, Laura! I love a maple in the fall and am happy to HAVE to write something about one! I love how you have the whole year here, Rebekah. That speaks to me, because a tree often seems to hold all of time inside of it somehow. Love your alliteration, too!